Airsoft pistols aren't kids toys but are the perfect hobby for an grown up who still hasn't grown up. You can get them in both the normal 9mm handgun style and even the old revolver style if that's what your heart desires. Airsoft guns fire a 6mm plastic bb at speeds of up to 450 feet per second. This can't cause any serious damage unless you get hit in the eye in which case you could be blinded if you're not using proper eye protection. What you'll love about airsoft pistols is the huge range that are available to buy right now. You have all the solid favourite from the movies - Glock, Beretta and the Desert Eagle and M1911 for example. Each airsoft pistol has a separate magazine for the bbs which is normally stored in the handgrip of the gun (just like the real thing). The number of bb's the clip can hold varies from one gun to the next but you'll normally be able to load about 30 rounds into your clip which is enough to plink some cans for a while without having to reload. That is unless you have something like a Glock 18C full auto AEG pistol which can empty a 30 round bb clip in around 3 seconds. 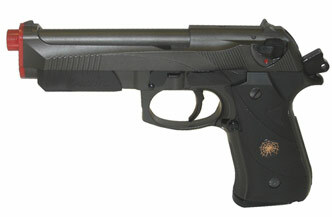 Airsoft pistols are available in spring, gas and electric powered models. The spring versions have to be cocked on each shot. The gas models need to be refilled after one or two magazines. With the gas models you can choose a blowback replica which simulates a realistic firing action by using some of the gas to force the topslide to fly backwards when fired. The electric or AEG models keep going until you run out of pellets and enjoy a reputation of being very reliable. Some of the AEG models have the blowback feature too. One thing to remember is that all new airsoft guns are manufacture with a red/orange mark on the muzzle of the gun. Why? Because these guns can look very real when pointed at you. Don't carry airsoft guns around with you in public places as they can easily be mistaken for the real thing. Check your local, state and national laws to ensure that possessing an airsoft pistol isn't an offence in your area. Not point in getting in trouble when all you wanted was some airsoft fun! Find your ideal airsoft handgun online today.